The first known settlement, which is referred to in one of the Russian chronicles is called Nikola on the Zhabna. The emergence of the settlement dates back to the XI-XII centuries - to the period of the economic and political rise of the Novgorod land. At that time, the tribes were active in trade, and they used the Volga River as their main means of transport. At that time the Novgorod merchants arranged strongholds along the riverbanks: churches and monasteries were built taking this into account. The Nikola on the Zhabna monastery also became this kind of stronghold for traders. Later on, the Nikolaevsky Cathedral was built on the site of this monastery. The church was given no mercy by time - it was rebuilt and repaired many times. What we see today in that same place are just the last remains of a magnificent architectural ensemble built in 1796-1800 by Kalyazin's masters. By the way, the height of the tower, which looks like it is emerging from the water, is approximately 74 meters. During Soviet times paratroopers were trained here - it was high enough to make jumps with pre-opened parachutes. However, their training ended after the first accident occurred. Since then, the bell tower stands alone, immersed in water, and is now the symbol of modern Kalyazin. 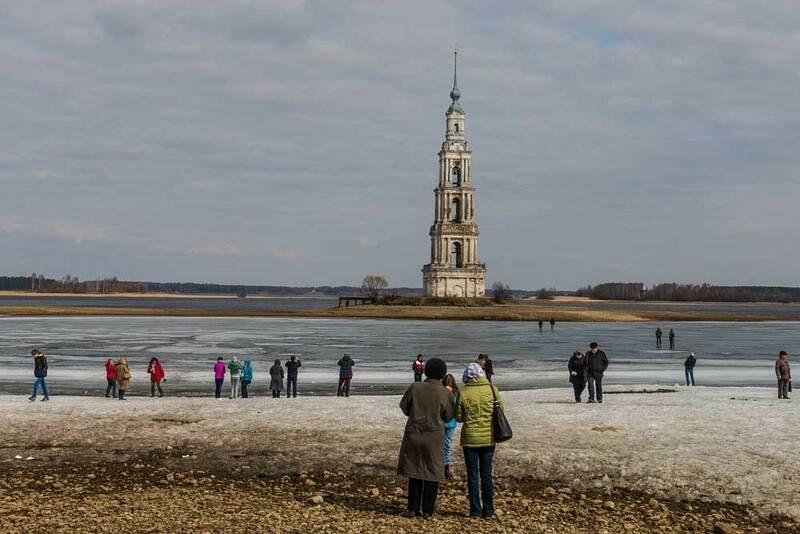 In ancient times the Kalyazinsky monastery was known all over the country - it was visited by great figures such as Boris Godunov, Tsar Mikhail Fedorovich, Tsar Alexei Mikhailovich and young Peter the Great. In the sixties of the XVIII century, even Catherine II stayed in the monastery. One can assume that the gifts of the guests were not that simple: in its heyday, the monastery owned 13 villages and 200 settlements. In all the villages, there was a total of 2,303 courts, in which there were around 12 thousand peasants. The monastery received a large income from bread plowing, land rental fees, fishing, and dues from the peasants in cash and in kind. After the 1917 revolution, to which the Kalyazin locals actively contributed and also assisted the Soviet regime, the city began to transform. At first, various cooperatives began to appear, which were later turned into factories. In 1919, there were regular trains going from Kalyazin railway station to Passajirskiy station when the railroad from Moscow to Dmitrov was completed. Another railroad, from Kashin to Kalyazin was also built. At the same time of the rapid prosperity of the city, the history of Trinity Kalyazinsky monastery began to fade - in June 1920 it was closed. At first, a regional natural history museum was organized there, and then it was transformed into a sanatorium of the Moscow electricity plant. Between 1939-1940 a part of the old city was flooded during the construction of the Uglich hydroelectric power station. 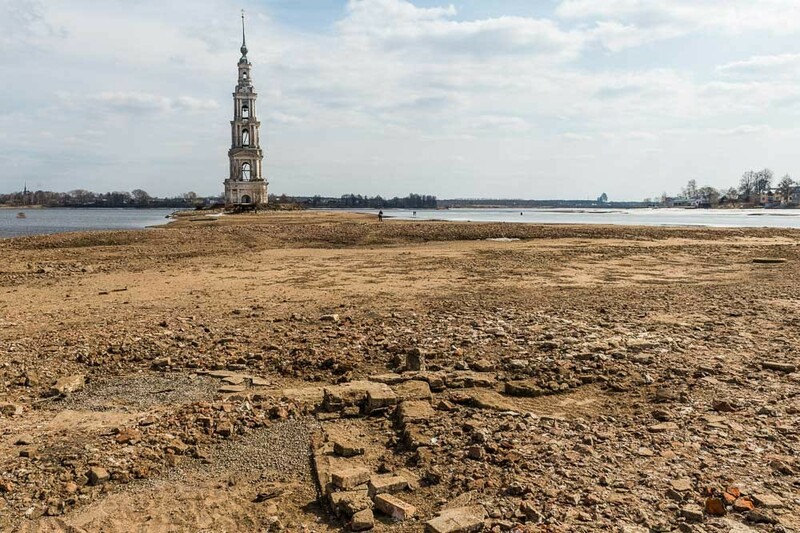 Some constructions of the Trinity Kalyazinsky Monastery got into the flood zone, which was blown up and dismantled before the flooding - only the bell tower of St. Nicholas Cathedral was left above the water. For an unknown reason, when everything was being blown up to go underwater, there was no time to destroy the bell tower. When water covered the whole city, they decided not to do anything with the tower, to leave it as a navigation mark on the water. They say that for quite a long time you could have sailed in the lower arch of the belfry on a boat. In order to keep the walls from collapsing, some ground was put around the bell tower and it all was turned into an island. And now, when you approach Kalyazin on a boat going from Uglich, if you look to the right you will be able to see a little island overgrown with grass. During the summer this island is the favorite vacation Spot of All Kalyazin locals. 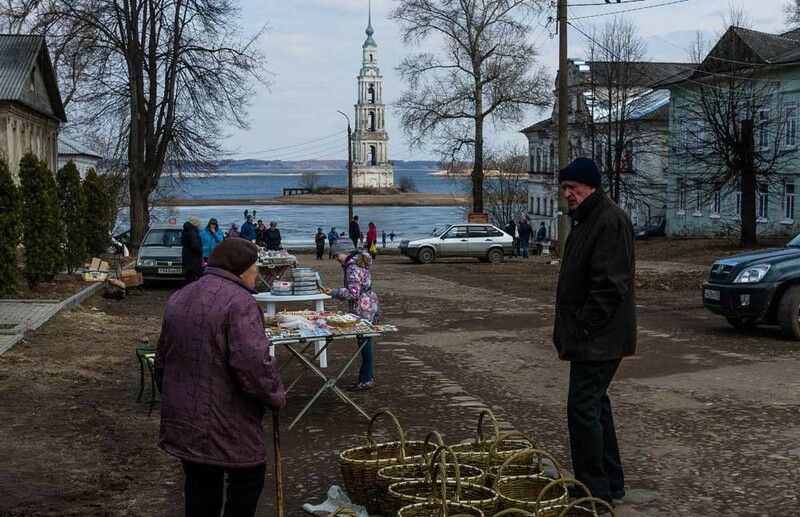 Today the bell tower is not only one of the most famous attractions in Kalyazin, but in the general Volga Region. There are many excursions organized with it, and many tourists are constantly being brought to the island. The bell tower, situated right in the middle of the lake is a beautiful, majestic and slightly melancholic symbol of modern Kalyazin.